I really had no preconceived ideas about what to expect on our recent trip to Lisbon, however I can say I wasn’t expecting a city covered in Graffiti. It was everywhere and when I say everywhere I mean EVERYWHERE! Thankfully, I’m not just talking about your standard tagging and rude obscenities written on bathroom walls or the side of public transportation, don’t get me wrong there is plenty of that too, but this is something else entirely. This is ART… and its good! And it’s not just in the “bad” neighborhoods either. During our wanderings we came upon a number of areas where entire buildings and even city blocks were completely covered with amazing paintings. I wondered, is this sanctioned? Do the city officials actually like it? Do people paint these large murals in the middle of the night? How did they get up there to paint that? 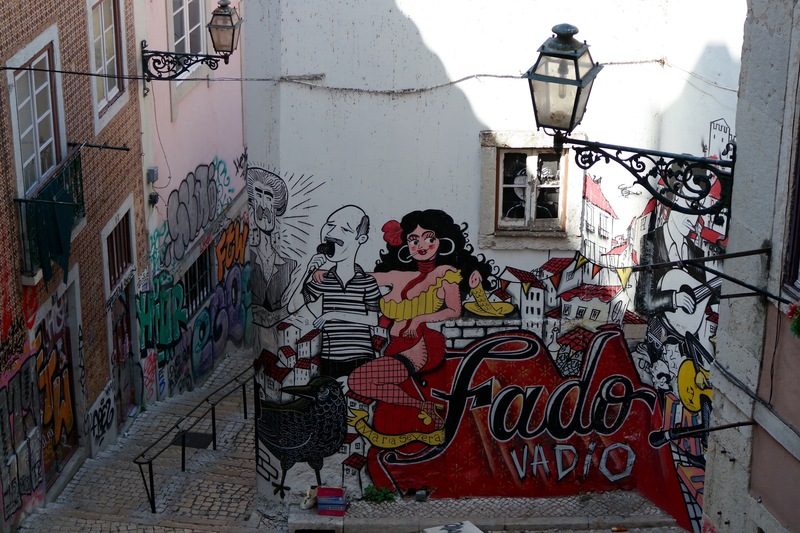 There was no mention of Lisbon’s Street art in any of the guides I read, but once I returned back to the states I did a bit of poking around on the internet and discovered that it’s quite a big deal! Like most major cities street art and graffiti have been in Lisbon for decades. However, in recent years their have been several different initiatives that were designed to help revive various parts of the city and at the same time give a boost to the urban art scene. Street artists came from around the world to participate! If you’re planning a trip to Lisbon and are interested in seeing this amazing art there are official Street Art tours, but we managed to happen upon a lot of the locations while wandering around. For answers to some of my above questions, check out this article about the Graffiti Grannies of Lisbon! Escadinhas de Sao Cristovao is the name of the street we stumbled upon quite by accident. While there is a lot of amazing street art there is plenty of typical graffiti too. It is a great city! Recently it seems “street” art has become a lot more mainstream, so the lines are definitely becoming blurred. When out hunting my play is to try and find works that aren’t related to advertising and are the works of artists expressing themselves for the sake of art whether they were commissioned to do the piece or no. It’s amazing isn’t it! I love that cities are recognizing ways to brighten up abandoned buildings while at the same time giving artists a chance to express themselves in a BIG way! Since our visit I’ve become more aware of these amazing works of arts and enjoy finding them in other cities as well! I’m also curious about how these are done. I know sometimes they are sanctioned but when they aren’t – how do you create something so large and not get caught?? Great photos! Thank you! I guess you’ll just have to go back! We loved Lisbon! I’ve since been “collecting” street art in every city I visit!